Are you stuck in a home that is full of clutter? Do you feel completely overwhelmed by the mess and you don’t know where or how to start? 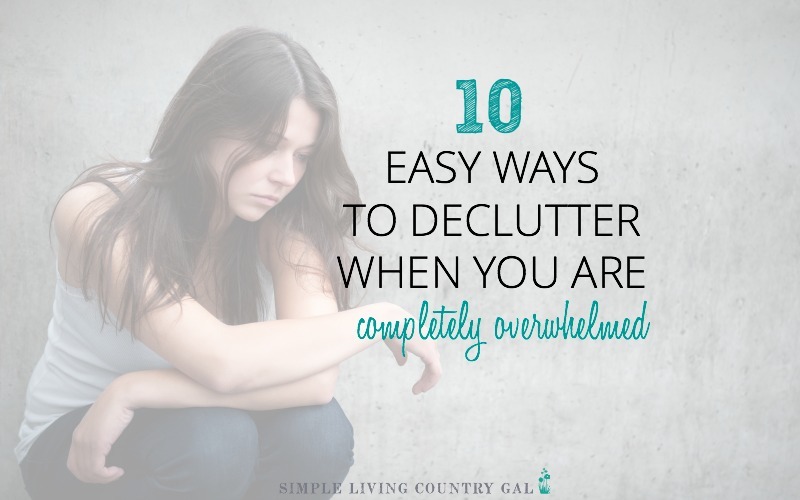 Then, this post is for you and will help you learn how to start decluttering when feeling overwhelmed. First, you need to know that you are not alone. There are so many other stressed out overwhelmed people standing right where you are today. I know you feel stuck and frustrated and just exhausted by it all. I used to feel that exact same way more often than I care to admit. I went from a messy embarrassing home to a neat on the surface with utter chaos underneath home, to a (finally) cleaned out, cleaned up, and organized once and for all home. Believe it or not, most of us have clutter in our homes. There is healthy clutter like that pile of magazines on the coffee table and unhealthy clutter like 47 water bottles scattered around the family room. To remove the clutter takes decisions. Lots and lots of decisions and just the thought of all those decisions is enough to stop us dead in our tracks. We only have so much motivation and we are fearful we might waste it on things that won’t make a dent in the mess. So, instead of just starting and hoping for the best, we shut the door and pretend the stuff isn’t really as bad as it actually is. Today you and I are going to tackle this clutter thing head on. In a simple get ‘er done approach that will remove the mess in a steady non-overwhelming way that will have you patting yourself on the back before you know it. 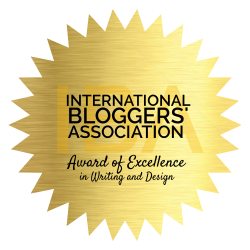 So, if you’re ready….let’s do this thing! #1 Take that first step! Okay, so not what you wanted to hear but actually just starting is the most important step on the list. To make it easier, countdown if you have to. Stand up, go get one of those small plastic shopping bags that we all seem to have hundreds of and start putting things into it. Right now. No more excuses. I promise that you will feel better once you do. Once you actually start moving, things will get easier and you might just surprise yourself at how many shopping bags you fill up! One of the biggest hurdles with any project is our tendency to overthink things. It’s pretty amazing how we can quickly and easily talk ourselves out of just about anything and decluttering is no different. So finding the simplest way to make a dent is the key to staying on track. Oh, I am so happy you asked! Try: Rather than decluttering the entire kitchen instead clean off the counter. Try: Faced with a cluttered filled bedroom? Begin with 1 dresser drawer and work your way from there. Try: Is your car an absolute disaster? Tackle the back seat. These small wins will motivate you instead of exhaust you. And that motivational train is something you can ride for the next hour cleaning out and cleaning up as you go. #3 Give yourself an easy win! Whenever I am helping a client declutter the very first place we start is the trash. It is simple, requires no decision making whatsoever, and can widdle down the clutter to a much more manageable project. Take a large black trash bag and simply take a stroll around your room. Grab anything and everything that can be tossed. Like to recycle? No problem! Take a second stroll or carry two separate bags. One for trash and one for recyclables. You might just be amazed at how much you remove and how little clutter you actually have. #4 Come up with a plan! Having a plan in place to deal with the stuff is the key to less overwhelm. When you know what you are doing, when you are doing it, and just how long it will take. You can pretty much kiss that overwhelm goodbye. My 7 Day Decluttering Challenge is a quick and easy way to get a jumpstart on the mess without any of the overwhelm. Each day has a super simple high impact task that only takes a few minutes to do. #5 Find a focused distraction! Hmmmm, that might not make a lot of sense, so let me explain. Burnout happens when we let our thoughts run rapid in our heads. So many other things need our attention that we might just find ourselves getting pulled somewhere else without even realizing it. If you want to stay focused, then you need to drown out the thoughts in your head. The best way to do that is either with music or a good book. 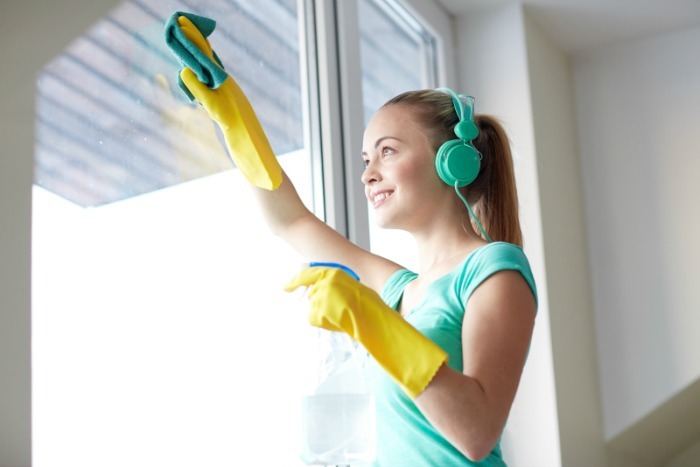 Nothing will get your home cleaned out faster than an incredibly great story. This is actually my insider secret and one I use myself anytime I am tackling a project I don’t want to. I have an Audible membership from Amazon and it is a game changer for me! I am able to download to my smartphone full unabridged books that I only listen to when I am cleaning or decluttering. This little treat actually GETS me moving and KEEPS me moving if the book is really really good! Nothing will get my house cleaned up faster than a heart-pumping horror from Stephen King! #6 Start in your bedroom! I cannot stress the importance of this step enough. Having a neat, inviting, uncluttered place to rest and rejuvenate is key to getting your entire life clutter free. There is no such thing as a peaceful nights sleep in a messy, cluttered and chaotic room. So take the time to tackle this area first so you can end and begin every single day on the right foot. Well rested and full of the energy you need to keep removing the stuff without any of the overwhelm. #7 We are not looking for perfection here! We are just looking for progress. Like ripping off a band-aid, you want to do it fast and quick so it doesn’t hurt. Start out easy and get the crap out. Torn clothes, old magazines, broken toys, ugly knick-knacks. Get it out fast. Worry about organizing and prettying things up later. Right now we are in clutter removal mode and that ain’t going to be pretty. But that’s okay, pretty isn’t want we are after…..yet! We just want cleaned out! Step #8 Get it gone….NOW! Another incredibly important tip is to remove it as you go. No making piles of bags and boxes by the back door. I want you to fill it up, tie or tape it closed, and put it into the trunk of your car RIGHT AWAY! This step is crucial when you are dealing with stress and overwhelm. Out of sight is definitely out of mind. You need to SEE results this early in, so get the stuff out of your house just as soon as you fill up a bag or a box. Then every time you are in your car make a point to stop by a donation drop off and get those bags and boxes out of your car. Nope, it doesn’t matter one bit if you are going every single day to drop off one box. Actually, it is better if you do! Everytime you remove a bag from your car it’s like a weight of things is being lifted from your shoulders. By doing this frequently you will enjoy that feeling again and again. This might just be easier said than done, but it doesn’t have to be. A clutter-free habit is basically a way to look at your things differently. So many clutter bugs tend to see their things as treasures. Paid for rewards for a hard worked life. Instead, try looking at your things at tools. Tools you use to live a life you love in a home you enjoy. When you see your things as tools, then you find it easier to let go of the 5 extra spatulas that you avoid as you are reaching for your favorite 3. Sure you paid money for those things at one point, but now you are paying a price for too much stuff and that is a much more expensive price to pay. #10 Keep goals short and sweet! I am all about keeping things simple, trust me it’s easier that way! Let’s set a goal right now to remove just 5 things every day for the next month. 5 things is easy, right? Easy enough to take no time. Easy enough to do it no matter how busy you are. Easy enough to handle no matter how overwhelmed you are. Maybe so, but look at it this way. If you remove just 5 things a day at the end of a month you will have remove 150 things. Those little things all add up to something pretty incredible. Your motivation for getting even more clutter gathered up and out of your home once and for all. Clutter can take away not only our motivation but our energy and focus. 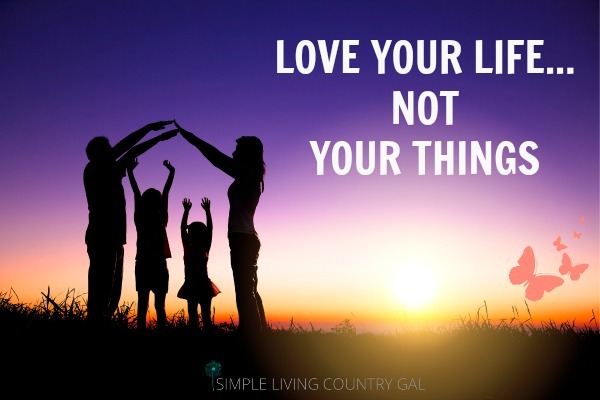 Life in a chaotic home filled with things can keep us from being truly happy. Tackle these steps just one at a time and you might just be surprised at the progress you can make. 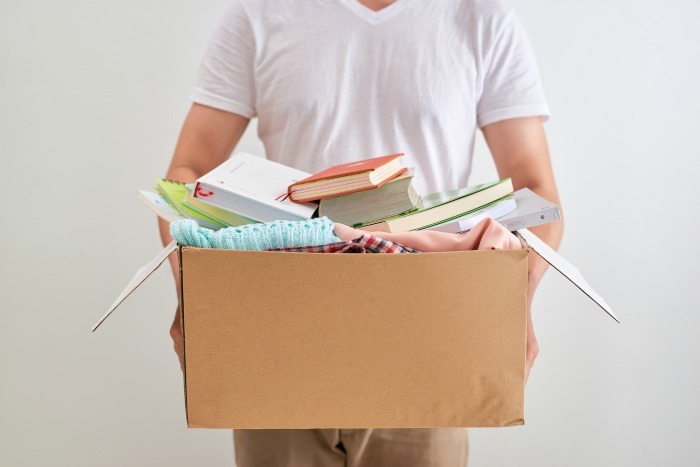 If you are still aren’t sure how to Start Decluttering When Feeling Overwhelmed you can find even more tips by reading How To Declutter Your Home When You Are Exhausted By The Mess.